According to the “mets” in the know (and “mets” is a familiar term not for a New York baseball team, but for meteorologists) just about this time, give or take a few days, we are in for a winter weather pattern shift over the northeastern two thirds of the United States. The North Atlantic Oscillation (NAO for short) is about to go “negative” on us and that can lead to a much colder pattern of air taking hold, particularly in a La Nina year. So hello and welcome Polar Vortex! Brrr! A few other things are leading the mets to this conclusion that winter weather will be arriving–and possibly a snowy pattern, or at least a stormy patterns–along with it. I will spare you the technical details. So of course what did I do around the end of November when I started hearing all this talk of negative NAOs? I consulted my squirrels! For those of you not familiar with the long accustomed practice of consulting squirrels’ nests as a way of predicting winter weather, it goes like this: the higher up in a tree the squirrel’s nest is, the colder (and presumably snowier, but I am not sure they actually predict precipitation–just cold!) the winter will be. I usually try to find a squirrel’s nest right on my own property. I knew that I must have one in an oak off the edge of my property because every morning and evening my dog loses her mind barking when she sees the squirrels running up and down the tree trunk. So I started looking up into the tree. Oaks are funny because they hold a lot of their leaves, even into the winter, so it’s sometimes tough to see into the canopy. So I guess the mets are right. It’s Polar Vortex time. Better break out the woolies. I’m already wearing the long underwear. Not sure how much more I can pile on! What does this blob of leaves in a tree have to do with a winter forecast? Weather lore says that the higher up in a tree that a squirrel builds its nests, the colder the winter will be. 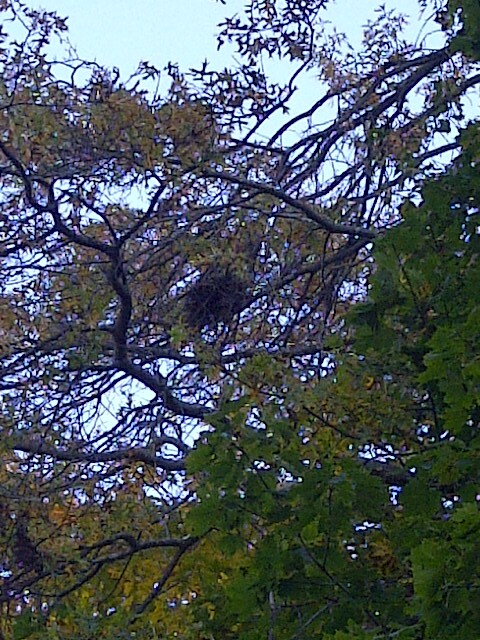 This nest is as high as I have seen since I learned this little “factoid.” That was in the fall of 2010. Of course the winter of 2011 in my part of the world was legendary–we had some ridiculous amount of snow in January alone–7 feet if I recall correctly. The Almanacs and Accuweather are calling for a slow start to winter in the Northeast. I’d like to believe them–but somehow I think that wildlife know better, sadly. No “Assistance” Needed, Thank You! Last month I had a post, riffing on a Gardenrant post by Michele Owen, about all the help I get in my yard with planting by my various backyard helpers. Michele’s post was called “The Assistants,” and specifically deal with the help squirrels had been in “planting” her garden. Here is that post for those of you who missed it. Lately I’ve seen a couple of different articles in different places (one of which was of course the New York Times which seems to have a city-phobic fear of all things natural!) about power failures caused by–of all things–squirrels! The piece in the Times actually ran in the Sunday Opinion section (technically called “Sunday Review”, I think). A less comprehensive Google article on the same thing shows a list of squirrel related power failures in May and June 2013. I’m not sure if the outages peaked in those months or if the article was self-limiting for some reason. Interestingly enough, the New York Times article has been picked up and cited all around the Internet. Fear of squirrel caused power outages is very real. But then again, none of us enjoys being in the dark, either literally or figuratively, no matter what the cause! Closer to home, just two weeks before the “snowmageddon” of 2011 that caused power outages of a week or more in many parts of Connecticut, Greenwich (CT) Patch had a story about a “massive” outage sparked by a squirrel that left over half the town without power. What’s more interesting is that squirrels have even wreaked economic damage. As this article from Money shows, squirrel-caused power failures have actually halted trading on the NASDAQ twice. As we get into autumn and squirrels become more visible (at least in my part of the country) I’ve always thought about them in two ways: one, as a bit of a nuisance, since it seems they’re always in the road, running their predator avoidance pattern that seems more like a kamikaze death dance; and two, as a harbinger of winter weather as I search out their nests in the trees and try to determine, from the heights, how severe the winter will be. But I have to say, when it comes to worrying about squirrel caused power failures, that’s one thing I’ll leave to the utilities. Rats With Tails? Not in My Yard! Anyone who knows me knows that I refer to myself as “friend to all wildlife.” I do it in conversation, I’ve talked about it here, even with the deer were ravaging the vegetable garden (by the way, the “Deerstopper” tape seems to be keeping them at bay–I do currently have nice pole beans and some green tomatoes), and I do it in all my lectures. When folks refer to squirrels as “rats with tails” I will often say that I find them far more clever than I am. After all, they are mammals just like we are so they are warm blooded. And if I had to find a way to stay warm and find food outdoors in my climate in the winter, I wouldn’t last 3 days–if I’d last that long! So I have a great respect for the critters that come romping through my backyard, even as they are ravaging it. That’s why I was so pleased to find that I wasn’t the only nutty gardener on the planet and that someone else shared my sentiments. Last week or so, Michele Owens, one of the “Ranters” of Garden Rant, posted about squirrels, calling them the “Assistants.” You can read her post, which is quite clever, here. The upshot of her post was that squirrels had planted many things in her yard for her. And while it wasn’t necessarily all to her design taste, she liked it. Chipmunks eat my alpine strawberries and plant them in cracks and crevices I could never get to with any tool. So creative! Ants, one of the most useful of the garden designers, have filled my lawn with grape hyacinths (muscari). When the bulbs goes to seed (because who deadheads grape hyacinths–with the minor bulbs it is actually discouraged) the ants actually transport those seeds some distance. They will take them down into their ant hills and the next year I’ll have grape hyacinths–or snowdrops–or scilla–in a spot where I hadn’t planted it. Squirrels seem to be the least creative wildlife designers in my yard–perhaps because of the deer problem. But that’s okay. They can stay anyway. And of course, with a possible repeat performance of last year’s massive storm–minus the snow, but with the crashing trees and power outages–on the way, it’s a miracle we can even think about anything other than the weather. If this blog goes dark, you’ll know what happened–again! Today, however, I’m going to talk about what I use to make educated guesses about the upcoming winter weather: squirrels’ nests and juncos. Let’s take the juncos first. For those not familiar with them, they are migratory birds that currently go by the name dark-eyed juncos here in the East, I think. Out west, they have a different name and there are even “races” of Oregon juncos, pink-sided juncos, and so on. Any wonder why I’m confused about what to call them? It was so much easier when they were all called “slate colored. When I grew up they were known as “slate-colored” because they are dark gray on top and white on the bottom. Cute little birds, about the size of most of your small sparrows or finches. It’s the coloring that distinguishes them in the landscape here in the winter from all the other “little brown jobbies,” as so many of those brown finches and sparrows can seem. Lore has it that when the juncos first arrive, the first snow is 6 weeks’ away. This year I saw my first junco–and not just one but whole flocks–on October 13. I counted forward 6 weeks and that put me smack in the middle of Thanksgiving weekend. That wouldn’t be out of the realm of possibility for snow around here–but at the same time, I do recall years when it was warm enough to wax my car on Thanksgiving. So perhaps the birds are telling us this is going to be a “positive” phase El Nino winter, or colder and snowier than normal. I started to calm down, however, as more leaves came off the trees and I saw that perhaps the reason that one squirrels’ nest was so high was because that particular tree had been “topped” by last year’s storm. All the rest of the nests seem to be at reasonable levels, like this one in my neighbor’s ash tree. (Again, it’s relatively hard to see–I think it was the cloudy day. We haven’t had much sun lately. This one is in the middle–3 trunked tree, on the right trunk, just above the horizontal branch). So perhaps the squirrels aren’t confused–or perhaps they, like the National Weather Service, are merely predicting “equal chances” of an above average or below average winter. Hard to say. I will say that the nests are not as high as they were in the winter of 2010-2011–so I think I can confidently say the winter is not going to be as bad as that (if you choose to believe the squirrels). Based on the juncos, however, there might be some early snow–so be forwarned. In October, I promised my winter weather predictions based on what the squirrels were saying (actually, based on what the squirrels nests were showing me). I did that last year and it turned out to be uncannily accurate, more accurate than the regular forecasters or the Farmer’s Almanac. Well, this year ladies & gentlemen, we have a split decision. This squirrel obviously thinks it’s going to be a warm winter–and I like this prediction because this is from a squirrel that’s built a nest right on my property (yes, I still do have one or two trees with tops left–but just a couple–that’s a post for another day). This squirrel, 5 houses away, has a different opinion. Its nest is much higher–as high as the ones from last year. It thinks winter will be bitterly cold. This is actually consistent with a La Nina winter–it can be both warm and cold depending on the “oscillation” or phase. So perhaps the squirrels know something the meteorologists don’t yet know–that we’re in for quite a ride this winter. And based on what’s gone on this year so far, would anyone be surprised? I wouldn’t.